A few Saturdays ago, I popped into No. 9 Park for a nightcap. 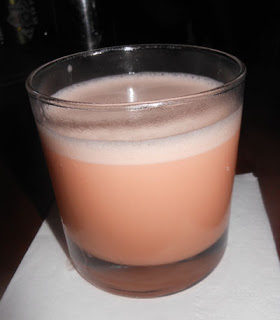 For a drink, bartender Ted Kilpatrick suggested the Inventor, a Cognac Sazerac Flip of sorts created by Tyler Wang. Ted forewarned me that the Flip has the color of Strawberry Quik due to the egg and Peychaud's Bitters. Without the lemon oil, the Inventor presented a Cognac and anise aroma. A creamy sip then led into a Cognac swallow that finished with the absinthe and Peychaud's Bitters finish. After I requested the twist, the nose was dominated by the lemon and surprisingly the swallow seemed earthier.